There's a 4 door Skyline? isn't it a time of a skyline sedan? Hey Rice, what is your prolem with Georg huh if ya dont like him get the f**k of this site..
read the side rules! No referenc laptime deleted. Claiming laptime from best motoring is not enough! Included a link for the DUMBASS that deleted the Tsukuba lap time of 1:09.07. I included the issue of Best Motoring which carried it, yet deleted.. So if it's not on the internet, it doesn't exist? - sigh.. The infiniti does 0-60 in 5.5. Consumer reports is not a valid source of performance data. The quarter mile is 14.0@100mph And the 6speed 2005-2007 g35 has 298 hp reduced to 295 under the new SAE standards. I am pretty sure it is. Just re-badged as Nissan. I entered the data you provided. 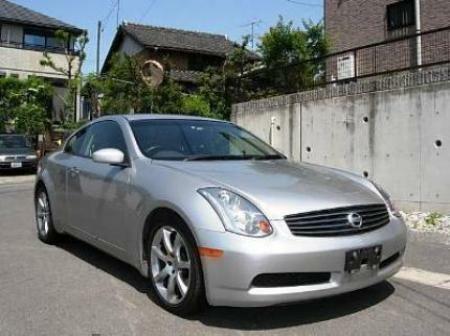 Is this 2006 Infiniti G35? The specs looks totally the same.